For the first time in my lifetime, Republicans have actually won a government shutdown fight. Granted, it was a Democratic shut down, but still, the media tried to present it as the Republicans fault. However pesky facts eventually ruined the narrative. In the post Fire and Fury era, the media take on Trump’s behavior is that he’s a doddering old man with dementia, who constantly needed his staff to tell him what his position is. Meanwhile Trump is agreeing with every Democratic suggestion, nodding his head, and driving Anne Coulter to pull out every bit of her long blond hair. The thing is, I’ve seen this show before. Candidate Trump in August of 2016 had a televised Town Hall with Sean Hannity in which he seemed to backtrack on every single immigration campaign promise he had made, appearing to soften on amnesty and basically toss away the entire raison d’etre of his campaign. Supporters or at least supporters who were with Trump because of immigration were aghast. What was he thinking? A week later, Trump announced a trip to Mexico to meet with Mexican President Enrique Pena Nieto. While in Mexico Trump played nice with the Mexican President and pulled off the statesman act. Then he jetted off to Phoenix to deliver an immigration speech in which he double downed on every hardline immigration proposal he had proposed. His supporters? Cheering and back on board! The MSM? Stunned, confused, and angry after declaring that Trump was growing on immigration, and predicting the speech would reveal a new, softened pro amnesty Trump. Instead they got the opposite and they just couldn’t process. This is a cycle that has repeated itself multiple times since then and will no doubt continue. So let’s break down what Trump did. First, he performed preparation of the battlefield by doing a public softening of his immigration proposals. This made it easier to go to Mexico and pull off the statesman act without creating a confrontation with the Mexican President. This clearly has elements of a 4D Chess master. Second, he swung back and fired up the base by standing firm on the immigration principles that had rocketed him to win the Republican primary in the first place. His supporters, after descending into the depths of despair, suddenly rebounded. This was the wrestling show aspect to the Trump show, or maybe it’s more like a Trump Opera; a Trumpera. That the media looked like idiots after their confident predictions was icing on the cake. This basic structure has been repeated over and over. Overall, it’s theory three; Trump is pulling off a professional wrestling work, with a storyline that includes massive swings of emotion by the audience, fear and betrayal, and then a swing of reproachment and then glorious victory. It’s basically the plotline of The Fate of the Furious. And this is what Trump pulled off dealing DACA, and Chuck Schumer, off the table and into a total surrender. And as long as the media and the Democrats can’t view Trump as anything more than an emotional, childlike idiot with dementia, it should keep working. A friend who is aware of my interest in the link between demographic change and political change slipped me this article, Why Demography Does Not Equal Destiny. You don’t hear much these days about demographics in politics since last November 9th, other than the talk about that new group that politicos recently discovered; the white working class. Who are these guys and where did they come from? Demographic change is not evenly dispersed in states and voting districts throughout the country. Voting behavior is not static. Voters more readily change which party they support than the demography-is-destiny models anticipated. Despite the large change in the demographic composition of the electorate, most voters still do not self-identify as liberals. In fact, liberals remain bronze medalists in the ideological breakdown of the electorate—ever since the question was first asked decades ago. I don’t disagree with the generalities of these points. In fact I share them to a degree and wrote about the snags and hiccups on the way to permanent Democratic rule over two years ago. Most voters are not liberal, at least they are not self-identified ones, and the purging of the moderate wing that began in 2010 has left the Democratic Party with few moderates for mainstream Americans to identify with. Political decisions matter too, and President Obama’s decision to go make Obamacare, rather than “comprehensive immigration reform” his first massive push doomed his party to an easy opening for attack. The Tea Party sprang up to fight Obamacare and the political cost for moderate blue dog Democrats to vote for it was the loss of their seats, leaving a smaller, and more left leaning Democratic Party in its wake. So for the past few years, the Democratic Party has been hurt more by stupid political decisions than helped by Demographic change. Nobody told them that they had to make a granny with 30 years of criminal investigations and corruption behind her the party’s nominee. Even though the Democrats nominated the worst candidate possible she still won the popular vote by 3 million votes. That really brings truth to the old saying about yellow dog Democrats; they would vote for a dog if it was running on the Democratic ticket. But that goes to Point One; demographic change is not evenly dispersed. No it isn’t. Particularly when you consider that the Hillary’s popular vote lead is entirely attributable to California. Without California, Trump won the popular vote by 1.4 million votes. That’s the power of demographics. Legal and illegal immigrants went from 9 to 27%. Went from 7th most educated workforce to 50th (that’s dead last for the California educated!). Went from 25th in income inequality to 6th. Conclusion? If you try to replicate Latin America in California, don’t be surprised if you get something that looks very much like…Latin America; high income inequality, with a very wealthy and educated elite with a large poor and uneducated mass of people, and of course, one party rule. California has successfully duplicated the Mexican model. And California, which has for decades been the early adopter of future American trends, shows us what the entire country will look like in a few decades. In the Trump, Black Swan era, it’s easy to dismiss demographic change as having an effect on our politics, but there it is, chugging along, year after year, turning the United States into California. There are some things that just are not at all true, but are still part of the conventional wisdom, and are repeated with frequency in magazine articles and talking head shows. 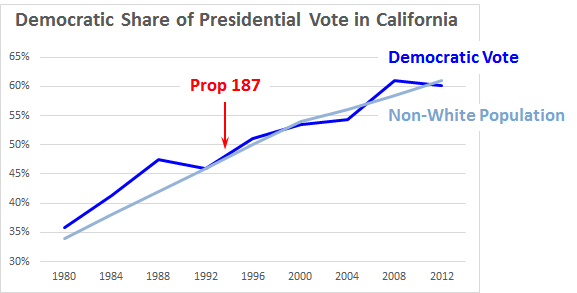 Lies often have a useful function and the longevity of the Prop 187 myth is due primarily to just how useful it is, to both sections of the left and right. And so this story is trotted out once again, in Peter Beinart’s piece in The Atlantic, The Republican Party’s White Strategy. This time, the purpose is to attempt to discredit Trump’s anti-illegal immigration strategy by arguing that it’s been tried before, to utter failure, and Trump is offering a redo of the same failed strategy that will lead to the same result as it allegedly led to in California, unending Democratic rule as far as the eye can see. Well there certainly is unending Democratic rule for as far as the eye can see in California. The gist of Prop 187 myth is as follows: The 1994 proposition forbade illegal aliens from accessing non emergency medical care, public education, and other California services. Republican Governor Pete Wilson latched on the proposition to win re-election, but by doing so, he destroyed the Republican Party in California by forever alienating Hispanic voters because of hate, bigotry, or whatever. Except for celebrity candidate Arnold Schwarzenegger, Republicans have been shut out from power ever since. Support for Prop. 187 was strongest among white non Hispanic voters (+28 points), and especially white males (+38 points). Latinos, on the other hand, voted No by a 73% to 27% margin. Blacks and Asians divided about evenly, with 52% voting in favor and 48% opposed. So in terms of an ethnic breakdown, Prop 187 was popular and won among all ethnic groups except for Hispanics. Even then, as Coulter points out, Proposition 187 was still more popular among Hispanics than President Bush was in running for re-election just 2 years earlier (14% in California). So Prop 187 passed and the voters never had contact with it again. Naturally this proposition went to the courts immediately and was finally struck down in the California courts in 1997. So how did a wildly popular voter’s referendum that helped a flailing Republican gubernatorial candidate achieve a massive re-electoral victory doom the Republican Party in California? Beats me. But that’s the myth. The greater the share of the non white vote; the greater the share of the Democratic vote. It’s the demographics…again. Prop 187 wasn’t even a bump on the road to Republican decline; that marched in lockstep with the share of the nonwhite electorate. This is now and will be soon replicating itself across the United States. Of course as I’ve noted, there could be stop sticks along the way, but the general trend, in our tribalistic era, is that the Republican electorate shrinks as the white population shrinks, and it’s shrinking everywhere. So even though the Prop 187 myth isn’t true doesn’t mean it’s not pointed out real problems. But the purpose of the myth is to force Republicans into open borders/amnesty types of positions; in other words, to accelerate the shrinking of their own electorate. It’s clearly obvious why the Democrats would support that, but why do so many Republicans fall for that too? It’s not called the stupid party for nothing.